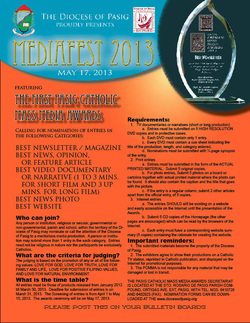 We are extending the deadline for all who wish to submit their entries for the first Pasig Catholic Mass Media Awards only this week, up to Saturday, April 6, 2013 at 5 p.m.
For those submitting their websites, save your files in .html. Any browser should be able to open the files, especially the first or homepage, which is commonly saved as index.html. Your websites should not have any glitches at the time of the judging. For the category of Best News / Feature / Opinion article, only those that are published on print shall be accepted as an official entry. Those written on websites are not qualified. For those writing Opinions, submit two more articles that reflect the heart and mind of the writer. God bless! Be the first one in the history of the Diocese of Pasig to be recognized for media excellence! Nevertheless, on this Easter day, the tomb of Jesus Christ is empty. There are no bones, there is no filth; nothing remains. He has risen from the dead. He is victorious over the pangs of suffering and death. He has triumphed over evil and sin. In the words of Clarence Hall: “You can put truth in the grave, but it won’t stay there. You can nail it to the cross… and shut it up in a tomb, but it will rise.” (Mark Link, S.J., Daily Homilies: Seasons and Feasts, p. 158, 1987) Are our tombs empty? Have we cleansed our lives of the decomposing effects of sin? The victory of Christ over sin and death is ours, too. The early morning resurrection scene challenges us to see GLORY after our humiliating experiences, to see JOY after all the painful events of life and to see HOPE amidst all of life’s depressing situations. Like the disciple who saw and believed (John 20:9), we reaffirm our belief in the resurrection of our Lord Jesus Christ. The resurrection in our lives can be seen only with the eyes of faith through which Christ will constantly tell us: BELIEVE!